Small group opportunities for friendship, spiritual growth, and catechesis can be effective in proving an entry point for non-Catholics or inactive Catholics into the life of the parish. Below are several options to consider from the Diocesan Evangelization Commission. pillars of Catholic spirituality”: Confession, contemplation, the Mass, the Bible, fasting, spiritual reading, and the rosary. Target audience is Catholics who are ‘in-between’…they know they want to come back have decided to or are considering a return to the faith, and want more information and spiritual guidance. This may serve as a logical follow-up to CRH (Catholics Returning/Come Home). Copies of the book are available from the Dynamic Catholic website Catholic Book Program for a discounted price ($2 or $3 per copy). Participants may be asked to purchase their books from the program for a small fee or the program may provide complimentary copies. Discovering Christ is a seven-week evangelizing process. It is a course that provides a relational context in which members of a parish, campus ministry, etc. can bring family and friends to hear the good news and personally encounter Jesus Christ. The course consists of seven sessions and a retreat day. Each session includes four components: a dinner (if the course is offered in the evening), a prayer time, a teaching, and a small group discussion. Each component is vital to the evangelizing process of Discovering Christ. Alpha for Catholics is a practical tool that parishes use to inspire Catholic renewal, answer the call to the New Evangelization and the call of Christ and His Church to "go and make disciples of all nations". The Alpha course is an effective tool for awakening faith in people who are on the fringe of the parish life, faithful Catholics and those outside the faith and a perfect tool to use during this Year of Faith. Each weekly session centers around a common meal, a short presentation of a basic truth of the faith, and small group discussion in which persons are free to ask any question. Alpha is very effective as a means of bringing people to this "starting point of faith," an encounter with the risen Lord Jesus. Alpha's introduces people to Jesus while teaching the foundational elements of our faith. The Catholic Way Bible Study is a curriculum resource offering individual sessions, short-term series, and long-term series focusing on particular biblical topics. The curriculum is easy and user friendly to implement in a parish or individual setting, offering a life changing journey through the Sacred Scriptures. All Studies and Series are appropriate for parish use, RCIA, adult education programs, retreats, parish youth ministries and continuing education for Catechist and Deacon Formation. Once a study is purchased, it becomes a part of the parish's library and can be used over and over again. Just print out the needed materials. Who: Introduction and orientation [for session leaders] by members of Diocesan Evangelization Committee. Study sessions would be led by designated member(s) of the parish. For order inquiries, call toll-free 866-928-1237 or email sales@wordonfire.org. Target Audience: Series can serve in ministry to RCIA and other adult lay formation; in training adult catechists; diaconate and other ministerial training; and mature high school or college/university coursework. Suggested program structure: Foundational – Twenty-two 60-minute sessions; Intensive – Twelve 2-2.5 hour sessions or Streamlined – Twelve 1.5 hour sessions. CATHOLICISM: The New Evangelization is a new documentary and multi-media formation program that explores the Church’s mission within the challenges of contemporary culture. Hosted by Father Robert Barron, the documentary focuses on the cultural challenges the Church faces today, such as the emergence of “the new atheism” and relativistic attitudes toward questions of faith and morality. While the content of the Apostolic Faith remains the same, all Catholics are called to share it with new ardor, new expressions and new methods. Reaching out to those in our culture who have already been baptized, but have drifted, we are called to awaken their faith and bring them closer to Jesus Christ and to his Church. In classic documentary style, Fr. Barron is joined by a large group of Catholics, both well-known and ordinary. Many leading commentators on faith and culture are interviewed (see interview list at FAQ button below). Fr. Barron also showcases numerous examples of individuals and groups proclaiming the Gospel with creativity and innovation. Whether it’s in the United States, England or Australia, we see the Church alive with a renewed spirit, talking about the Lord with new expressions, and reaching out globally with new communication tools, such as Facebook. 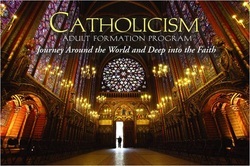 “CATHOLICISM: The New Evangelization” is accompanied by a study program for adult and mature teen faith formation, which was written by Brandon Vogt, author of “The Church and the New Media” and a well-known Catholic blogger and advocate of the Church’s evangelization efforts via the new media. The Study Program can be presented in six sessions (90 minutes each). This new Program will be released in late August, 2013, but you can pre-order now to reserve materials for formation events in the fall. 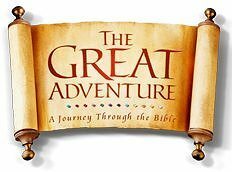 What: Parish Religious Education Program utilizing the Great Adventure Bible Timeline Video Overview of Salvation History to provide teaching the fourteen narrative books of the Bible covering each period of salvation history (24 part series). Each 50-55 minute presentation has an accompanying lesson in The Bible Timeline Study Kit. Who: Study program leader(s) designated by the parish. women's small group programs and recommended reading for women's small groups; and finally, men's small group programs and recommended reading for men's small groups and websites for Catholic men. To examine more resources, check out the Diocese of Sioux Falls website, in their Adult Formation section.